Warning : This comic book series is NOT meant for children. Once upon a time, in the faraway land where fantasies and realities intertwine, a handsome prince charming who hunts and collects rare and invaluable treasures in the form of arcane books of visual stories (read: comic addict) presented one of such comic books to the Princess of the Faraway Land (ME!). He presented me with the first volume of a comic called 'Fables' in the form of a trade paperback. The first volume was titled Legends in Exile and consists of the monthly Fables comic issues 1-5 . He knows that I didn't understand his interest in comics and to introduce me to comics, he thought that Fables would be the perfect comic series for me. He said I was going to like it since he knows that I'm into Disney movies. Now, he doesn't share the same passion that I have for Disney movies which is not surprising for a guy. But even a fairy-tale hater like himself enjoys reading Fables and it is a comic book which can appeal to everybody. Just to side track a bit, I am going to reminisce a little here. When I was little, I didn't really like playing with barbie dolls or soft toys. My dad had to buy me boys' toys. You know, robots, control cars and the likes. I remember my mum saying that if I was given a barbie doll I would rather play with the box instead of the doll itself. Don't ask me why because I really have no idea. Growing up, I was never into Snow White, Cinderella, Jasmine or any of the princess characters all the other girls wanted to be but I liked watching the Disney movies because of their stories and the way they were told. I never grew up wanting to be a princess. My favourite Disney movie of all time has to be the Beauty and the Beast (no princesses in that one :p). Now, back to Fables. I loved the book at first sight. I also love the artwork on the cover. Now before you laugh, comics aren't as 'childish' as you would think it is because the artworks are very impressive and the story-telling too. My boyfriend also told me that some of the comic-writers are actually the same people who direct or produce movies as well, so there is a lot of creativity in comics. My first impression of Fables is that it is a dark fantasy comic / graphic novel. So since it was a gift from my boyfriend I read it immediately as soon as I got it. It is a definite page turner and I couldn't put it down. It is basically about all the fairytale characters who are immortals and are all living in their own community in present-day New York. The story is told as real and complicated as it can be. Since these fairy tale characters (or 'Fables') have lived for a long time, a lot of things has happened and some of the innocence of the fairy tale characters have gone. The way the story is told is so interesting and beautifully twisted. I love it when a new fairytale character pops up. The way the fairytale characters are depicted is interesting and funny. For example (spoiler alert) Snow White as the deputy mayor of Fables Town and the frog prince is now a janitor. The best thing about Fables is that we all know the characters and can relate because we've watched the Disney movies. Yes, Beauty and the Beast got married, but do you want to know what happened to them after the marriage? 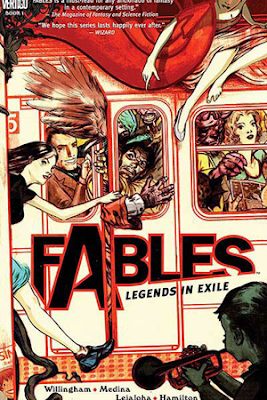 Then Fables is the comic for you. It's hilarious. And you should see what Prince Charming turns out to be today. There's pinnochio, sinbad, red riding hood and just about everyone else. Okay I better not spoil this on-going series for you. I love it so much that I've now gone on to collect up to Volume 12 of the series and waiting for the new volumes to come out. What happens after happily ever after? check it out in Fables.